An “untimely blurt” about considering suicide while on the telephone with a friend leads to the arrival of police at her apartment in Chicago. Jessa Crispin was in a rut, constrained by the lives of those around her. She had to get away, and Europe meant a complete break from things; she would keep only what was “worth keeping” — her work. And she would talk to the dead to learn how they left the constraints that bound them in life. It was not her physical life she wanted to destroy, she writes, but what she was doing with it. She occupies a chapter in such disparate locales as Berlin, Sarajevo, Galway, Lausanne, and Jersey Island over the next 18 months. Six months into her new home in Berlin, Crispin is out of sorts, decidedly unsure as to why she is there when she begins to read William James. She finds “a friend, a mentor, a professor, and some sort of idealized father” in his philosophy, and his works filled her need to escape the bottom she had reached. James had arrived as a failure. She discovers here and in subsequent travels that learning about the past informs how she views the present and the future. In each stop she observes the lives, works, and connections that surround the lives of William James, Nora Barnacle, Maud Gonne, Claude Cahun, and others. She meditates on her life and the connections which frame her, while trying to escape her self. Yet, even as she travels, she is still connected through Skype to her lover, through email to various literary jobs (Even in a search for enlightenment, one must sustain oneself. ), and with friends and acquaintances who help her land rooms or sublets in various cities. 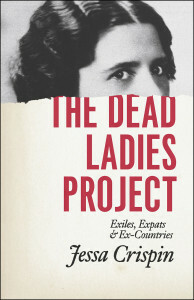 Those familiar with Bookslut, the on-line literary magazine Crispin founded, will recognize in The Dead Ladies Project her insightful literary judgement, her persuasive manner of expressing her opinions, and her sense of humor, sometimes self-deprecating, often profane, but always on-target. The reader will also find a journey of self-discovery revealed through Crispin’s reflections on the tribulations of those dead writers she encounters along the way. Reading The Dead Ladies Project provides a glorious opportunity to participate in Crispin’s self-discovery and appreciate her courage in laying bare her soul.